In the early morning light this morning, carrying the camera, I walked to the far end of the back drive to open the gate for Aaron. 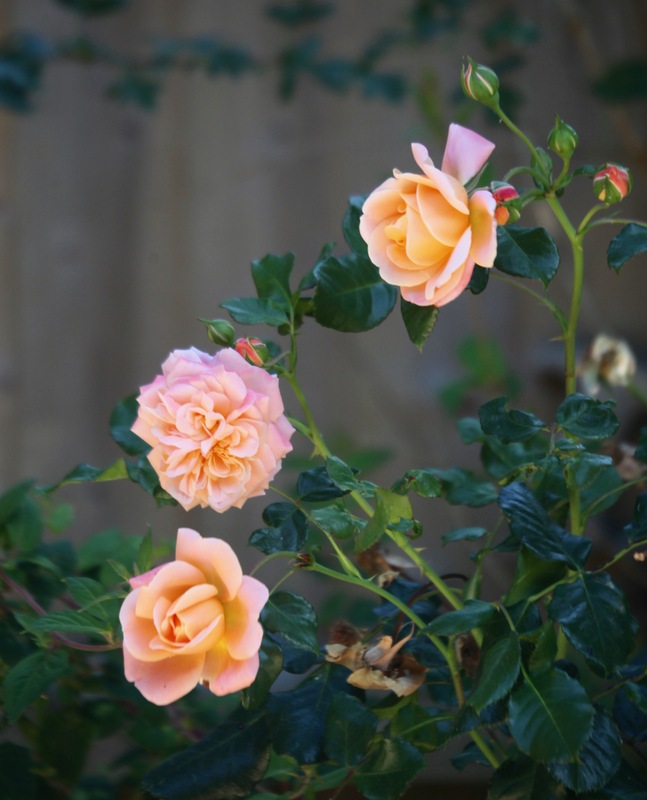 The peach rose we inherited beside the patio is producing more blooms. 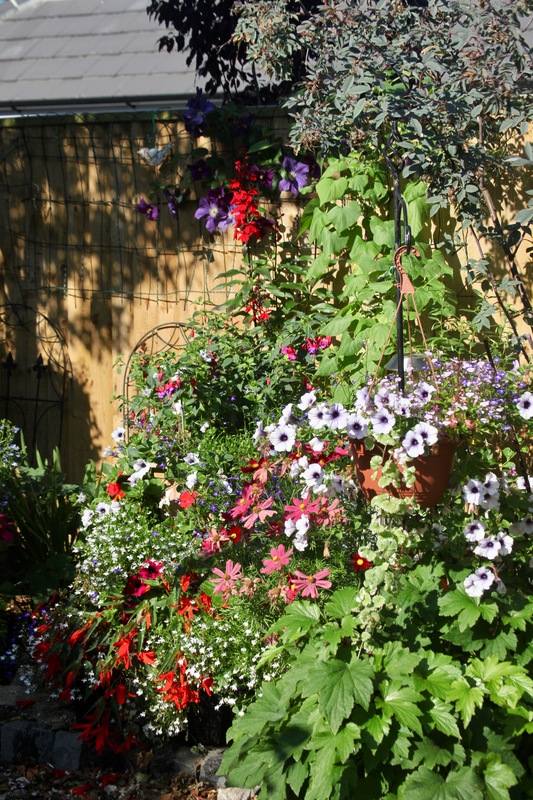 Just one example of Jackie’s splendid planting in that area includes petunias, cosmoses, clematis, fuchsia, begonias, and lobelias. 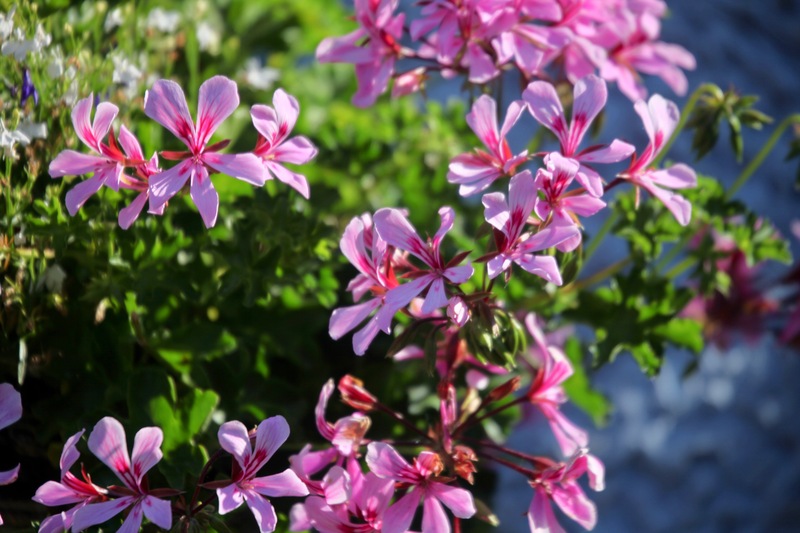 This geranium hangs in a basket suspended from the kitchen wall. Fuchsia Delta’s Sarah in the bed beside the Wisteria Arbour was still in shade. After taking this picture I dead-headed a number of small orange poppies. 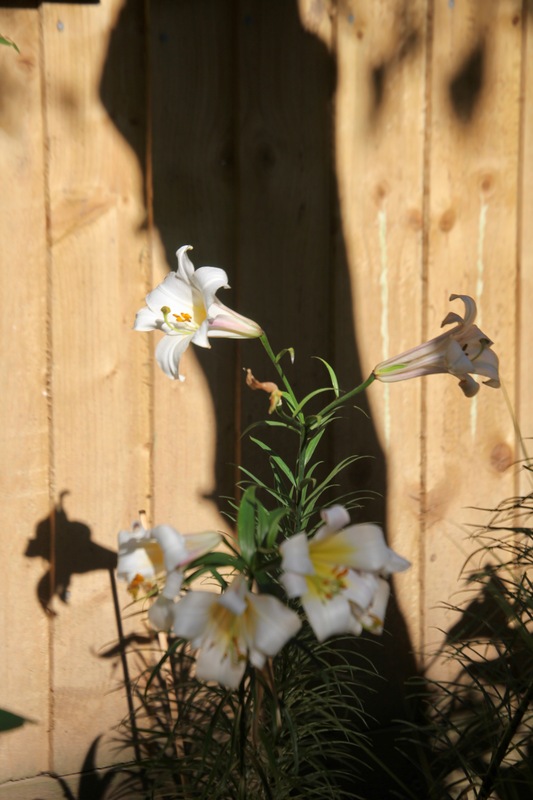 Clumps of these heady scented lilies stand either side of the Westbrook Arbour. 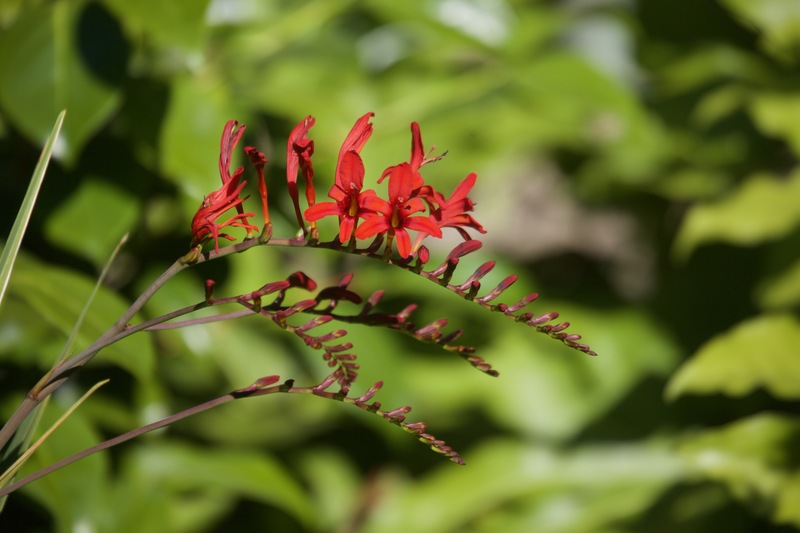 I turned into the back drive around the corner of the New Bed, where crocosmias blazed in front of verbena bonarensis. 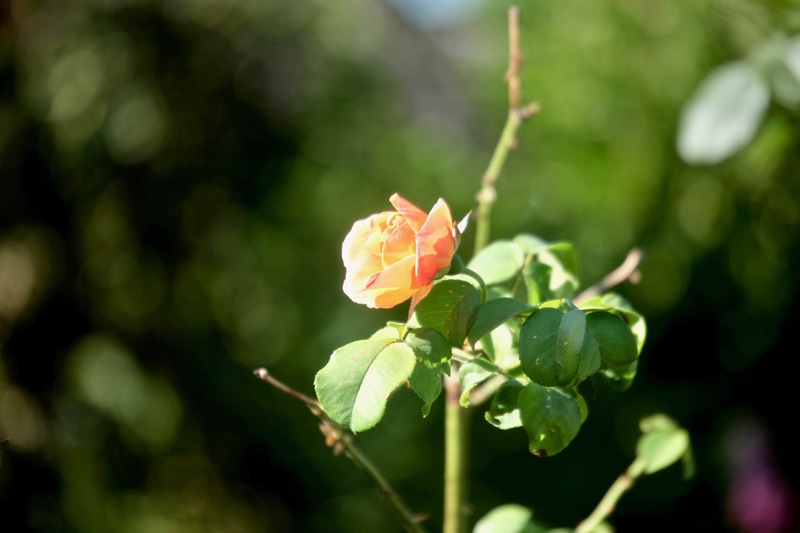 There are two Dearest rose bushes in the herbaceous border along the drive. One is laden with blooms; the other is struggling. Later, Elizabeth visited with Danni and Andy in order to deliver various items of equipment for her room. My sister has sold her house and not yet found another. She will live with us while she seeks one. Jackie and I watched the Wimbledon men’s final between Kevin Anderson and Novak Djokovic. and a bright red hydrangea. This evening we dined at Lal Quilla. I chose Davedush, while Jackie’s preference was Chicken dopiaza. We shared an egg paratha and special fried rice, and both drank Kingfisher. 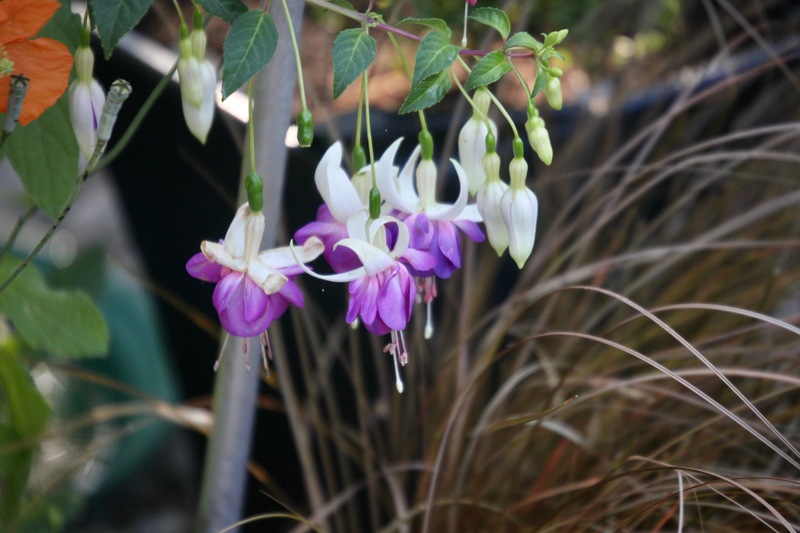 This entry was posted in Uncategorized and tagged begonias, clematis, cosmoses, crocosmias, day lilies, Dearest, Delta's Sarah, fuchsias, geranium, hydrangea, lilies, lobelias, petunias, roses by derrickjknight. Bookmark the permalink. Another delightfully colourful Morning and Evening in the Night (sorry ‘Knight’) household. Sometimes I wonder how you can bear to live with so much changing beauty in your own back yard, Derrick–I would daily swoon from it all. Gorgeous post! Very many thanks, Cynthia. It does make it difficult to go look for anything else to satisfy my desire to retain variety in my posts. Makes sense…but keep sharing your meanders! 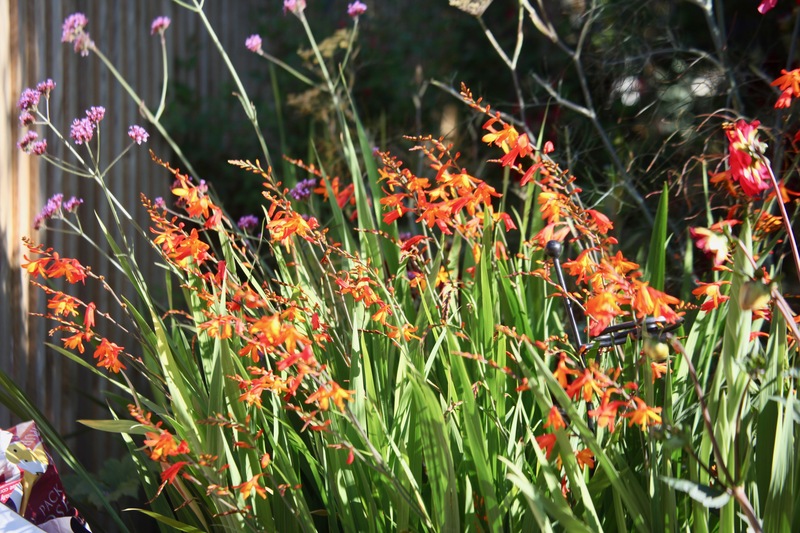 Jackie is a genius at putting the right plants together for maximum delight in her garden. I often think that when I’m gazing at the different combinations. It’s great news to hear you walked unaided and carrying your camera down the back drive. Progress is coming along nicely! You’re right about Derrick’s progress, Pauline – I am practically taking it for granted now. . .
As you should, sir. Activity is the key and you are no couch sitter. Very many thanks, on both counts, Pauline. Interesting the difference between the morning and evening light. Love the cluster of plantings in the second photo. And that last photo is incredible. So your sister is coming to stay – that will be fun to hear about – always something going on with Jackie and Derrick. Unedited – wow – That’s a keeper. Nice job. Interesting – I had wondered about your process. What a beautiful day to stroll through the garden. I’m so happy your recovery is going well, Derrick. Derrick, I am overjoyed to hear you are getting better and better with the passing of each day! Sending you all my love and best wishes from Athens! Beautiful flower photos again, and good you are getting about again. Amazing photos, colorful blooms. What a lovely garden Derrick! Your gardens looks so colorful! 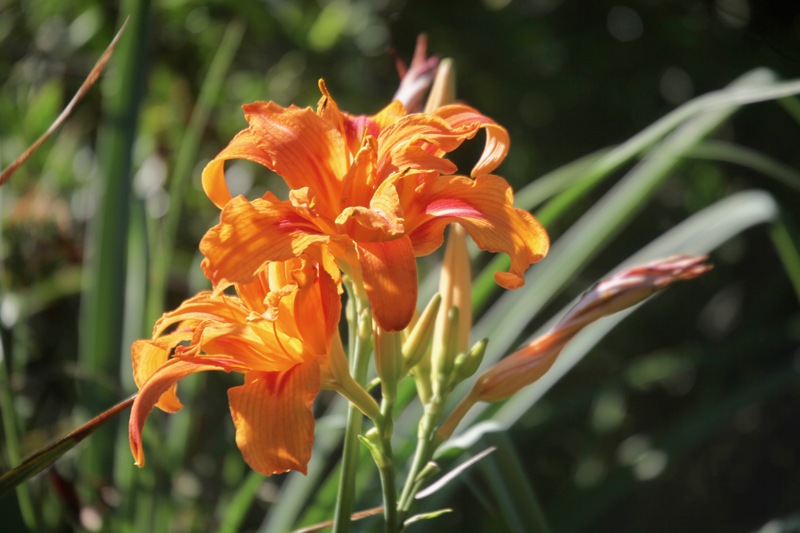 Our wild, orange dayliles are finishing up, and it is the reblooming daylilies that are now opening. “Jackie’s splendid planting” indeed. 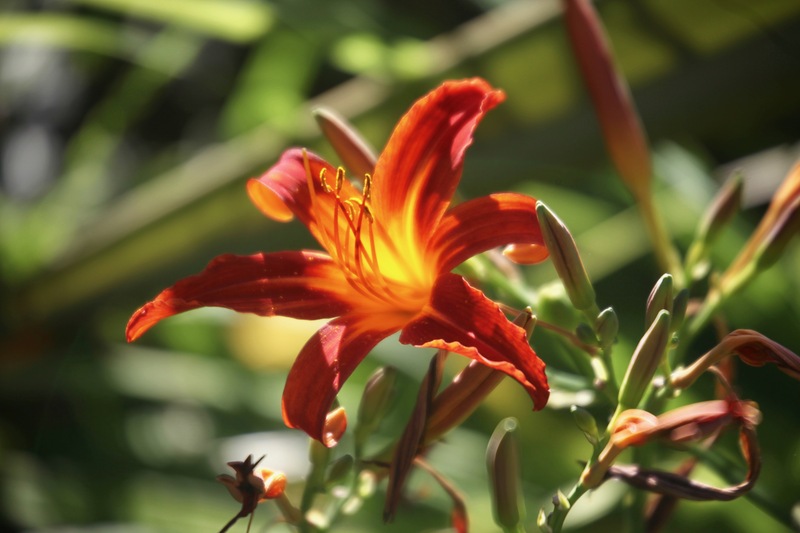 The garden is beautiful with such a wonderful variety of color and types of flowers/plants. It’s wonderful that you are getting about so well now, Derrick. It’s amazing how light changes. Not everyone sees it. So glad you’ll have Elizabeth’s company for a while. I hope she finds a good place. And your progress is very satisfying–more to you than us, I bet! Thanks very much, Lisa. Off to the first surgeon check-up today. Are you a poet, Derrick? Buried on this page is a most delicious poem. Don’t you just love the names of flowers? 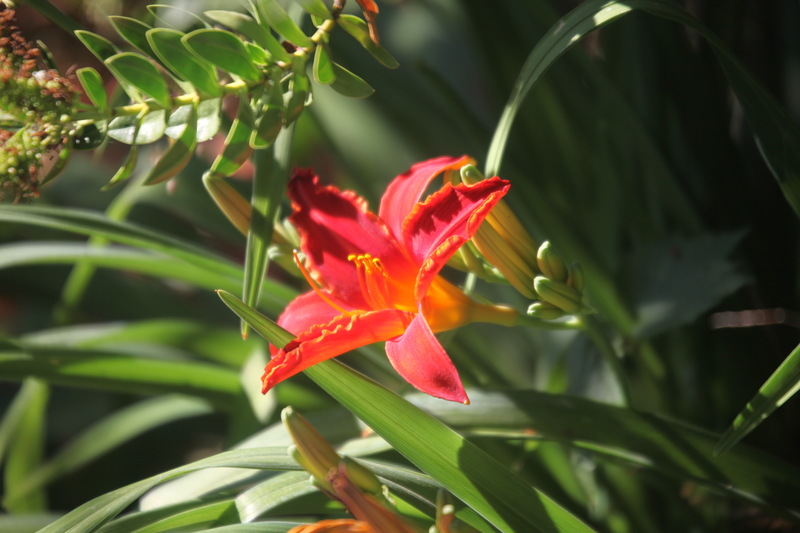 Even the old favourite “day lily” rings a carillon of sound and meaning. “Dearest rose bush”, what a name for a fantastic flower! It is amazing how the light changes the color and impact of the flowers…an important observation for a photographer and artist! That has got to be a special walk in the early morning light. The burst of boom that followed is a testament to your health. Glad you thought of taking the camera with you ! I love seeing your flowers and reading about them! 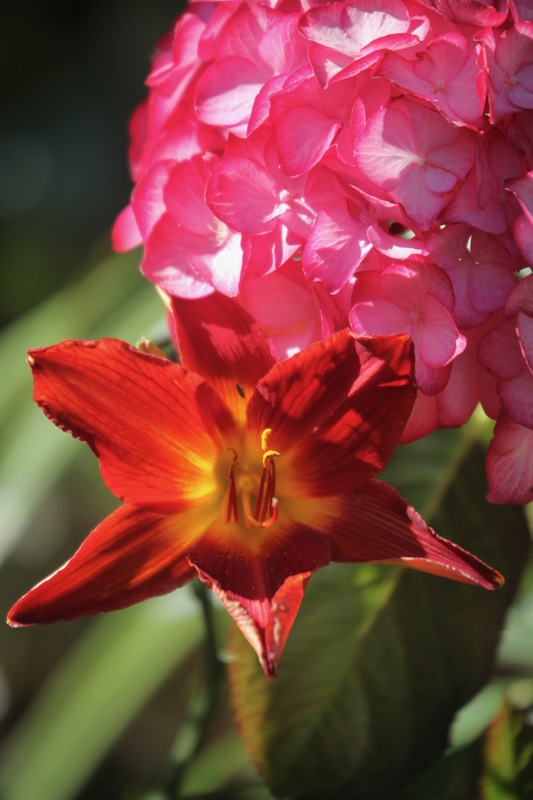 You have some of my favorite in your garden…like Fuchsia and Lilies! The light and shadows in these photos are beautiful! Best wishes for your sister as she finds a new house to make into a home. You have the most beautiful garden Derrick. I watched the Wimbledon final as well and was pleased with the outcome. Did you also watch the World Cup final? We were happy with that outcome as well. Thanks very much, Karen. I din’t watch World Cup final because of clash, but was happy with the outcome. I would have preferred Anderson to win the tennis because he had fought so hard to be there. I didn’t expect that outcome, though. I’m a big Novak fan, and France is the closest country to Germany. Anderson also beat my second favorite player John Isner who is from NC, so I couldn’t root for him. Peach colored flowers are my favorite, but for some reason I’ve been getting a variety of purple/fushia/pink colored ones lately – go figure, eh?!! Flowers look great as usual Derrick. Enjoy your time with your sister. Your garden is looking a treat. A delight to the eyes as to be expected from your photographic talents Derrick.